Myriad factors make India exotic, one of them being that it houses the tiger, a fierce and majestic animal. The tiger has for centuries kindled the interest of people. Tiger tales are replete in the country’s mythology and Indian folklore. 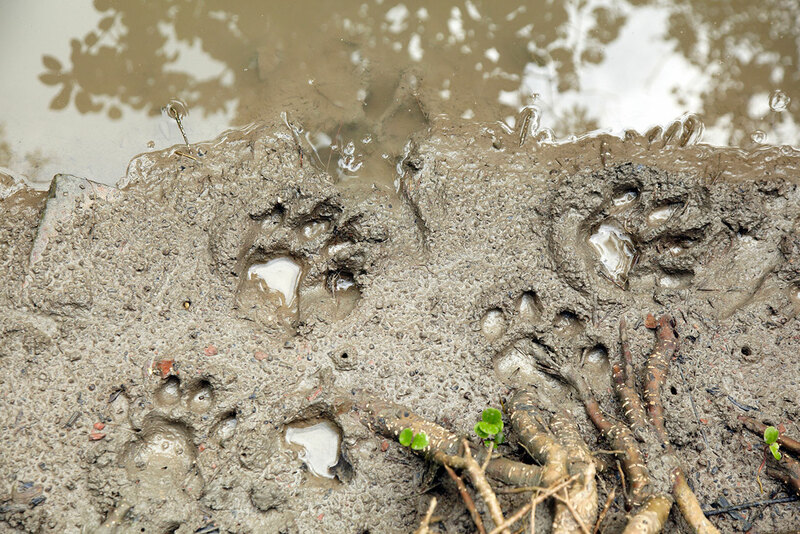 Pictured are tiger paw prints left in the mud. Shot taken from the Indian film, Roar: Tigers of the Sunderbans. The Atharva Veda (the Hindi religious text of magical formulas), the Hindu epics–the Ramayan and the Mahabharat–and Buddhist tales bestow occult powers on tigers. Tigers were believed to have the power to bring rain, battle dragons, safeguard kids from nightmares and have healing prowess. Winged tigers have been shown as flying into the Milky Way, carrying princesses on their backs, on a mission to save the world. In Islam it’s believed that tigers protect the faith’s followers and mete out punishment to traitors. The Warli tribe of India worships the Vaghdeva, the tiger god. They think of the tiger as a symbol of life and regeneration. They offer a fraction of their harvest annually to the tiger. They also consider the animal as a harbinger of fertility. When Warli couples visit the temple of the goddess of marriage, Palaghata, they adorn themselves in colorful red and yellow shawls. The tribal Indian folklore states, if the goddess is not pleased, the shawl will turn into a tiger and devour the couple. If the goddess is pleased the couple will be blessed with a bonny baby. Warli paintings depict a tiger as a part and parcel of daily life, both relaxing in and prowling through the villages. The Baigas of Central India, consider themselves as descendants of the tiger. In the state of Nagaland, tigers and man are said to be born of the same mother spirit, hence brothers. Both have been believed to emerge from a common passage which happened to be the pangolin’s den. Tiger dances, in which young kids participate, are an intrinsic part of the tradition of the Udipi town in Karnataka. In North Bengal, both Muslims and Hindus worship the Bengal tiger. Paintings depict a Muslim priest atop a tiger fighting evil. The Hindu goddesses Bonbibi (The bride of the forest) and Dakshin Rai safeguard the forest dwellers from crocodiles, demons and last but not the least the tiger’s wrath. Rice, sweets, and fruits are offered to Bonbibi and Dakshin Rai is pacified with music so that they keep the fury of the striped feline at bay. Shiva, the consort of goddess Durga, wears the skin of the tiger, which is symbolically indicative of the fact that he’s beyond the peripheries of the natural world. As per the myth, Lord Shiva was wandering through the forest naked. The wives of the forest dwelling sages were awed by his stark naked beauty. The sages felt insecure that they’d lose their wives. They captured a fierce tiger in a pit and thought that it would slay Shiva. He slew the animal and wrapped its skin around his body instead. The revered and fearsome animal is at times also shown in benign light. For instance, Indian folklore speaks of sages praying in sanctuaries surrounded by placid tigers. Tiger fossils have been discovered in India aged 12,000 years, indicating when the tiger made its entry into the region. The Ice Age made north Asia inhabitable for tigers. That compelled them to seek greener pastures in southern territories. The tiger has been etched on the seals of the ancient Indus Valley Civilization (2900 BC-1900 BC). The tiger of the Bengal state of India has been the country’s national symbol since 2500 BC. The animal was also the royal symbol of the Chola dynasty from 300 A.D to 1279 A.D. Tipu Sultan, who ruled India in the late 18th century, nurtured great admiration for the Bengal tiger. The tiger population depleted with indiscriminate hunting. In fact, tiger hunting was a popular royal pastime. In the early 16th century, Emperor Akbar initiated this kingly sport in India. His descendants continued with this practice till 1857 which marked the fall of the Mughal dynasty. Rajput, Mongol, Afghan and Turk nobles of India also went on a tiger hunting spree. They rode on troops of elephants and entered the dense jungle to drug, bait and kill the tiger. They triumphantly exhibited the severed head and hide of the animal in their royal palace. They backed the hunting of the animal with the excuse that the tiger was perennially lusting for human blood (which is factually wrong). Bengal tigers continued to be mercilessly slaughtered in India during the latter phase of the British rule. Colonel Geoffrey Nightingale fired bullets into and thereby killed 300 Indian tigers. In the 1920’s, the second Umed Singh, the king of Kotah, hunted the animal at night with machine guns and cannons. The Rewa kings of Central India thought it was spiritually fortunate to kill 108 tigers for their crowning. Historian Mahesh Rangarajan calculated the number of tigers slaughtered from 1875 to 1925 as exceeding 80,000. Not all of these thousands of tigers were hunted by royalty. Some were killed as they were thought to be a threat to man. The massacre of tigers continued in the early years of independent India. Royalty and non-royalty alike went on tiger hunting escapades. Maharaja of Surguja proudly proclaimed that by 1965, he had killed 1,150 tigers. The most powerful tigers were hunted to flaunt the hunter’s bravery. Consequently, the strongest felines were eliminated from the gene pool. 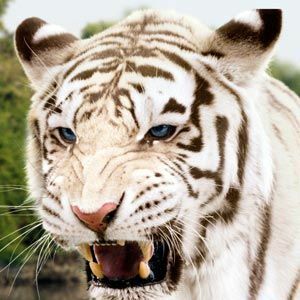 The white tiger is a pigmentation variant of the Bengal tiger, which is reported in the wild from time to time in the Indian states of Assam, West Bengal and Bihar in the Sunderbans region. Rising stars in Hollywood draped themselves in tiger hides, flaunting them as the latest fashion. Tiger rugs and coats from India were sold worldwide at exorbitant prices. Prime Minister Indira Gandhi, upon coming into power, came down strongly on tiger poachers. At the end of the 19th century, when Rudyard Kipling had written Jungle Book, there were 50,000 to 100,000 tigers. In 1971, just 1,800 of them remained. The Delhi High Court in India banned tiger hunting in 1971. There were 4000 tigers at the time of Indira Gandhi’s death in 1984. After her demise, once again the tiger population started dwindling. Tigers were illegally hunted for their bones and to procure ‘Chinese medicine’. In 2010, 1,706 tigers were found in India. 2,226 was the head count of Indian tigers in 2014. Under the Wildlife Protection Act of 1972 of India, killing a tiger elicits maximum three years of imprisonment and/or a fine of Rs 25,000 ($370 U.S dollars). If a tiger is killed inside a tiger reserve, then it’s a mandatory jail term of three years which may be extended to seven years and a fine which ranges from Rs 25,000 ($740 U.S dollars) to Rs 2,00,000 ($2960 U.S dollars). If the animal has been killed in the core area of the tiger reserve, it’ll result in seven years of imprisonment and a fine ranging from Rs 5,00,000 ($7,399 U.S dollars) to Rs 50,00,000 ($73,990 U.S dollars). Despite this, tigers are still poached. Sometimes tigers are killed when they encroach on the villages in search of prey, because of deforestation. Boars are regularly tied to a stake in the forest fringes outside the villages, so that the tigers are always full stomached and therefore don’t have to hunt man, cattle, poultry, goats and sheep. It’s not the natural tendency of a tiger to feast on human flesh. Very seldom do tigers become man-eaters. Wildlife conservationist, Valmik Thapar, suggests that experts should judiciously ascertain if a tiger is a man-eater or not. He feels that if a tiger is too dangerous to be rehabilitated into the wild, the animal should be put to sleep peacefully. rather than serve the remainder of his natural life behind the bars of a zoo. At times, furious mobs have lynched tigers which have killed men. Often livestock graze in forested areas during which the tiger may capture and eat them. The reason for grazing in the forested area may be that the pasture lands of the villages may have been over-grazed. Human beings, in the search of honey and firewood, venture into the forest depths, and inadvertently walk right into the jaws of the tiger. Often these gatherers have no other source of employment. Tigers are excellent swimmers and can easily pounce on boats and flee with prey. The fishermen in tiger areas are at great risk of tiger related deaths. 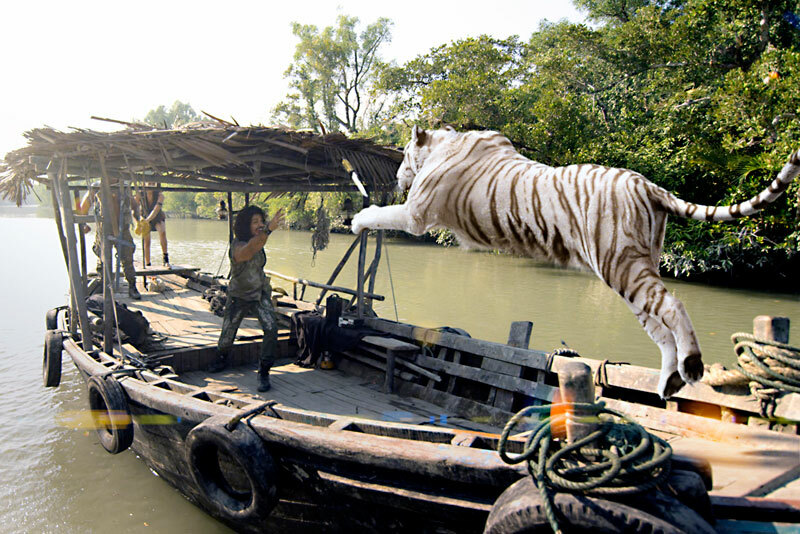 A scene from the film, Roar, shows a white Bengal tiger pouncing onto a boat. Bengal tigers have incredible power and athleticism. The government, in some areas, has made fences out of wooden poles and wired mesh; to keep away tigers from villages. An aversive technique to keep away tigers from villages is electrified human dummies which will produce a mild electric shock. The dangerous tigers receive a shock which is powerful enough to render them unconscious temporarily. The tigers are then captured in cages and freed in a dense area of the jungle. Financial compensation is given to families who have lost their family members and farm animals to the tiger. Efforts are being made so that the tiger and man can peacefully co-exist in India. A tiger is a carnivorous mammal, which lives between eight to ten years in the wild. On an average, it weighs between 240 to 500 lbs. The wild cat’s roar can be heard from three kilometers away. The Indian tiger loves to feed on deer and wild boar. If it doesn’t find deer and boar; it may have no choice but to prey on birds, rodents and insects. The most common diet usually available to wild tigers in India is comprised of the chital or spotted deer, sambar deer species, sika deer, nilgai (antelope), buffalo, gaur (bison), civets, monkeys, porcupines, frogs, fishes, crabs, giant lizards and snakes. At times, they’ll also hunt baby elephants and rhinos. The feline’s favorite hunt time is on cloudy days or at sun set. They prefer hunting alone instead of in pairs or packs. They take advantage of their coats to camouflage in the flora of the forest and pounce upon their prey when they least expect it. After the kill, they tear apart and eat the prey in a secluded spot. To facilitate digestion, tigers may eat the following: berries, grass and fruit. During courtship time, male and female tigers attract one another with howls and whines. Males start roaring to which females respond. When they meet one another face to face, they purr and sniff one another. Post conception, the cubs grow in the tummy of the mother for 16 weeks. A white Bengal tiger and her cub resting. A litter of three cubs is generally born. Each cub weighs approximately two pounds. The cubs don’t leave the den for the first two months. The father tiger at times tries to kill the babies. If any human being takes away the cub, the mother tiger is likely to sniff the trail and rescue the cub after killing the human. Tiger cubs have a high morality rate. The cubs learn to hunt with their mum. Generally, there’s one dominant cub in each litter. The following states in India have tiger reserves: Assam, Arunachal Pradesh, Bihar, Chattishgarh, Jharkhand, Karnataka, Kerala, Madhya Pradesh, Maharashtra, Mizoram, Orissa, Rajasthan, Tamil Nadu, Uttar Pradesh, Uttarkhand, West Bengal and Karnataka. The Royal Bengal Tiger has been made the national animal of India because of its strength, grace, agility and power. Photo of Bengal tiger seated next to a cast member for the movie Roar. Although CGI helped create various scenes of tigers in action, real trained tigers were still used on set for the film. The Royal Bengal Tiger is often not mentioned by its generic name by the forest dwellers/villagers bordering forests in West Bengal. The prevailing superstition is that the forest goddess whose mythological vehicle is the tiger, will get peeved as she considers referring to the tiger by its real name disrespectful. The tiger has therefore been nicknamed: Raymoni, Babu (master), Alubepari (referring to the male tiger’s testicles which villagers think resemble potatoes), Bon Bibir Bahan (the vehicle of the forest goddess). It’s feared that if mentioned by its name, the tiger will attack. · “Bagher bachcha bagh”: A tiger’s baby is a tiger (literal meaning): The attributes of a praiseworthy person prove that’s he’s/she’s like his/her laudable parent just like a tiger cub is also a tiger (figurative explanation). · “Jekhane bagher bhoy sekhane sondhe hoy”: Where you spot a tiger, evening sets in (literal meaning): There’s danger already which is being intensified just like darkness sets in when you see a tiger. 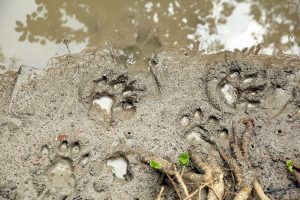 · “Jole kumir, dangay bagh”: There are crocodiles in the water and tigers on the land (literal meaning): There’s trouble all around just like one being surrounded by crocodiles and tigers, in water and on land. · “Bagh mama sheyal bhagne”: Uncle tiger and nephew fox (literal meaning): To indicate a close bond like a fox and tiger (the fox is said to trail the tiger for leftovers, hence the apparent idea of a close bond has developed) (figurative meaning). · “Bagher pechone pheuer moton”: Being close at the tiger’s heels in the hope of meal remnants (literal meaning): Referring to flatterers and sycophants, who please powerful people for favors like carrion animals follow the tiger for scraps (figurative meaning). The current ruling Bharatiya Janata Party government of India led by Prime Minister of India, Narendra Modi, is apparently toying with the idea of stripping the tiger of its national animal status and giving it to the lion instead. All animals are beautiful creations of God including the lion. Nevertheless, this replacement may work against the tiger, which is already a seriously endangered species in the country. Wildlife activists have expressed their disapproval regarding this. Let us hope, that the tiger continues to be the country’s national animal and efforts are made to save and multiply them. Movie poster for the film, Roar: Tigers of the Sunderbans. All pictures in the article are taken from the Indian film, Roar: Tigers of the Sunderbans, directed by Kamal Sadanah. It was a fictional film on Indian tigers released in 2014. I have the permission of the director, who is happy to give us pictures from the official website of his film. If you’d like to check out the movie for yourself or learn more about the the film click the link, Roar, to see more. 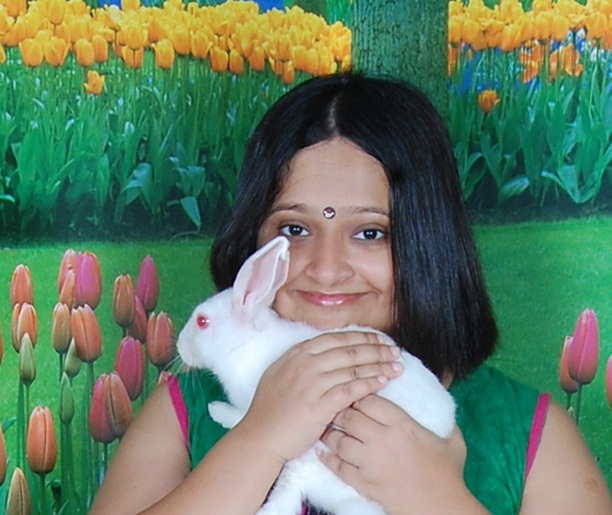 This entry was posted in Blog, india, Who Or What Is and tagged Pallavi Bhattacharya, tigers, wildlife by Joy Jones. Bookmark the permalink.